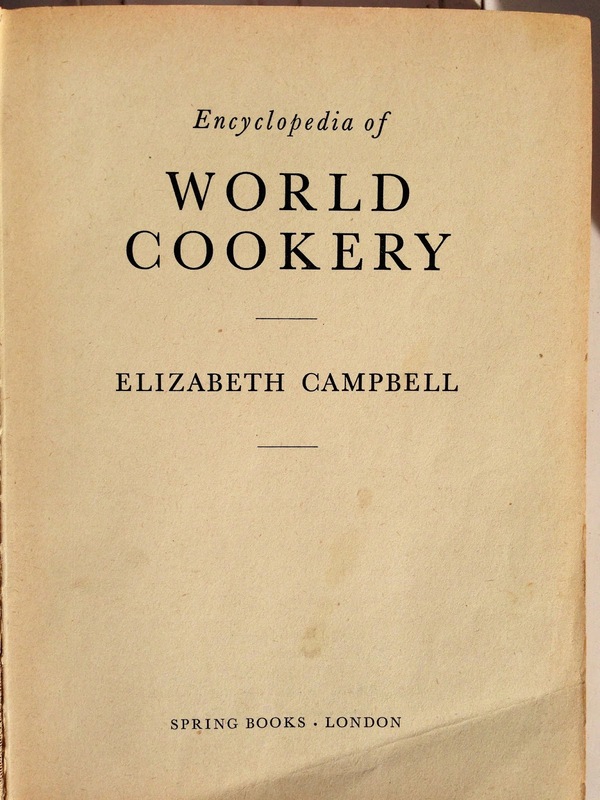 On the weekend my mother-in-law gave me one of her cook books- Encyclopedia of World Cookery by Elizabeth Campbell published 1958, an unexpected gesture. The pages are very very yellow and the linen cover quite worn and stained. By chance I just flicked to the very back and there was her famous Ginger Fluff Sponge recipe! I decided that the ingredients were written by one of her young daughters and the method written in an adult hand. The ingredients at the bottom of that page, she told me, was for a plain sponge, and nothing to do with the one above. I remember clearly as a young wife this ginger fluff sponge made an appearance at every BBQ, every birthday, christening or afternoon tea. In fact any family occasion, the ginger fluff sponge was in attendance. We looked for it first on the cake table and if it didn't appear we asked the question WHY? As you can see the recipe has been well used. 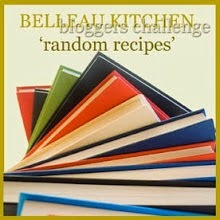 This would be perfect to enter into this month's Random Recipe Challenge over at Belleau Kitchen for September. Dare I make it? 1/4 teaspoon carb soda or 1 tea spoon baking powder - strange options but I presume you made do with whatever you had in the cupboard. Add sifted flour, cream of tartar and either soda or baking powder which I used. Pour into sandwich tins and bake in a moderate oven (what is a moderate oven? As my oven is fan forced and tends to be very hot I opted for 160C) in retrospect it probably should have been hotter. Bake for 20-25mins. I baked for 18 mins and then took the sponges out as they were as brown as I would have liked and when tested with a skewer came out clean. Cool and fill with whipped cream. Well I think I have a long way to go, to even come close to my mother-in-law's ginger fluff sponge, as mine was quite dense, edible, but definitely not fluffy! 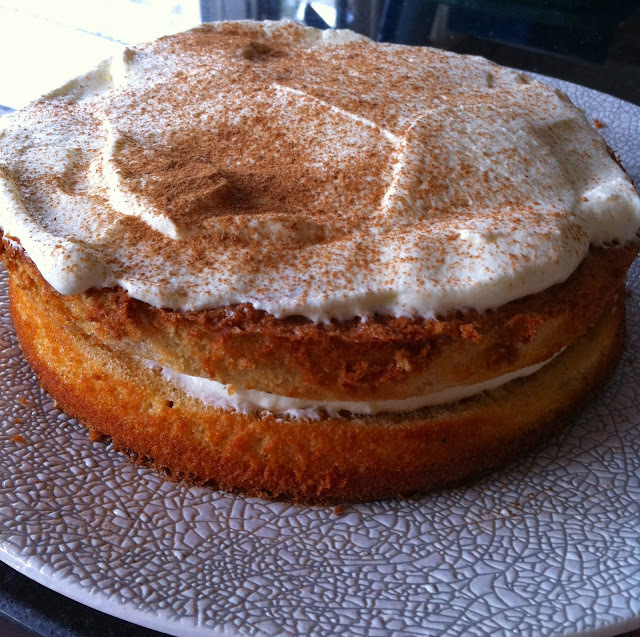 I decorated mine with whipped cream on the top and a little sprinkle of cinnamon. In by the skin of my teeth once again to Random Recipes No. 32 at Belleau Kitchen Pop over and join in if you can. I love the name too, it conjures up everything CWA (Country Women's Association). Looks lovely - can't quite see the point of the teaspoon of cocoa powder, but then if a recipe works - it works. Maybe the cocoa is for colour? Might have to practice a bit more maybe double the ginger and take out the cocoa, mine was not fluffy like Jean's though so obviously did something wrong. This is FABULOUS! Old, well worn recipes are the best! My Fluff was not as fluffy as it should have been so I might have to perfect this a little. 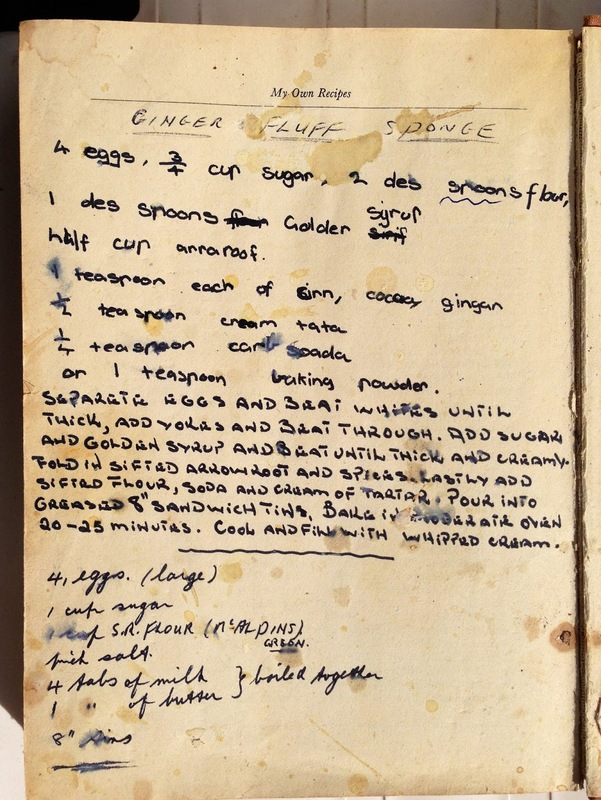 I love these old heritage recipes...especially when hand written. I haven't heard of a cake using arrowroot before as a main ingredient. Oh I suppose arrowroot biscuits do. I use it to thicken fruit sauces and soft gels without using gelatine for clear glazes but this sounds delicious and looks great. 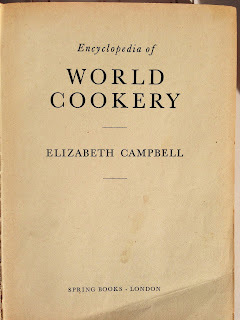 I have never cooked with arrowroot, I have only used cornflour for thickening sauces. I had to be particularly careful as the arrowroot seemed prone to go lumpy. This old recipe is a family favourite so I need to get it right. Yes the oldies are really worth hanging on to. You have tempted me to cook something else vintage from it. This is recipe gold! What a lovely thing to have. I love that the page is so spotted with evidence that the recipe has been used a lot. What (if anything) could you use instead of arrowroot? A little touch of history! Not sure what you could use instead of arrowroot? Will need to check with the mother-in-law! Arrowroot flour it seems is an alternative to cornflour (although a more silky texture) and used as a thickening agent. It is a very fine white powdery substance. It was easily accessible in my supermarket in the baking section. This looks lovely and what a fabulous book. Its quite an unusual book for its time. Recipes are divided up into countries with Australia and New Zealand at the front! Could be some interesting posts coming up. What a busy girl you must be these days. My "fluff" needs a little more practice to earn the name. Thanks for popping by. The secret to a good ginger fluff is in the beating of the eggs. I don't separate the whites and yolks, rather just beat the eggs (whole) and sugar for a minimum of 20 minutes. My goodness - will need to try this technique - I am all for shortcuts. 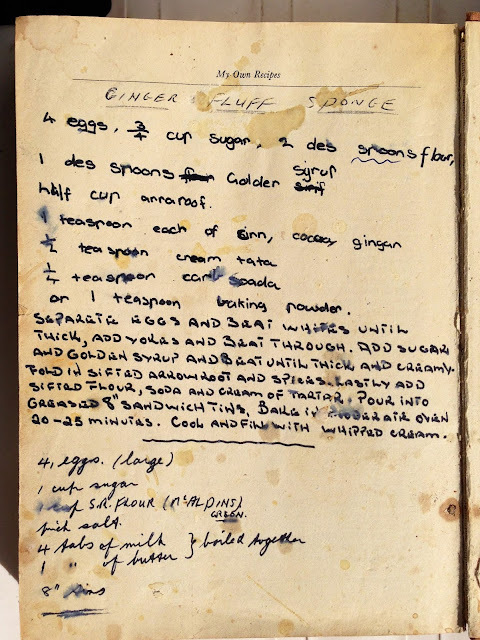 I've been googling ginger fluff recipes as my gran is in hospital and was reminiscing about the GF she and her sister used to make for each other when they were sick. My uncle is a chef so I called him to ask him about it, and he said any "old" recipe would do BUT (he emphasized) make sure the eggs are room temp AND you sift the dry ingredients ATLEAST three times, otherwise it won't be fluffy. After your experience, I thought this might be helpful for your next attempt. Hopefully it'll work for me too!